After 164 years and four generations, the last remaining farming member of the McLean family is moving on from Waipu. Having started their association with the district in 1853, when John and Dolina McLean, originally from near Loch Ness in Scotland, brought their large family to Waipu via a period in Nova Scotia, the couple’s great-great-grandson, Warren, has now listed the 159 hectare family farm, Waihoihoi, for sale. As Warren explains, the family broke in the land, which was originally known as Birdgrove. “John and Dolina had about a dozen children. To make a living, they had to bring the land into production, which they mostly did by hand, also using horses where they could, though on steeper country, that was impossible. They were known as hard workers, and they managed to tame the country,” he said. While a large family provided a ready source of labour, it also meant the Birdgrove McLeans needed to keep growing the farm. “When the sons married, they were each given a bit of land with a new house built on it,” says Warren. Initially dairy farming, Warren’s father sold the milking cows and took the farm into sheep and beef. “My grandfather, Danny McLean, died relatively young. My father, Murdoch, was therefore young when he took over, which meant he could keep the farm going, doing it his own way, though the women were strong as well. I remember my grandmother. She was always growling. She was a McKenzie, and her mother was a Macauley, so there is plenty of Scots blood in us,” he says. During Murdoch’s era, the family farm was extended to the hillier country of the Brynderwyns. “Dad employed about half a dozen others to break in that country during the 1940s and 50s. They had to do it the hard way, using axes and slashers. That was when aerial topdressing started to come in, which is what kept them going. If you didn’t have fertiliser to put on, all that work to cut down the bush and establish pasture was money down the drain,” says Warren. 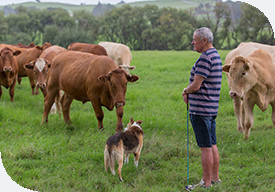 During his own era as Waihoihoi’s custodian, beginning in the 1960s, Warren has always focused on purchasing well-bred stock, therefore establishing a reputation of supplying top-quality livestock to the market. With the remaining members of the Birdgrove McLean family now city people, and Warren now in his late 70s, his logical option is to sell Waihoihoi, which he has engaged Scott Tapp of PGG Wrightson Real Estate, Wellsford, to do. “Waihoihoi is an historic finishing unit on flat to easy rolling contour, with spectacular pockets of native bush and water year-round from the creek. It is centrally raced and subdivided into 32 paddocks with excellent fences, and a soundly renovated homestead originally built in 1900. Its location, at the foot of the Brynderwyns, 44 kilometres south of Whangarei and 114 kilometres north of Auckland, will ensure plenty of interest in this well-regarded property,” he said. Warren plans to move seven kilometres north, into Waipu township, where he has a house being built, though he doesn’t expect to stay away from the cattle industry. “That’s what my life has been around. I will still go to sales. I know plenty of people I’ve bought cattle from over the years, through most of the North Island. You need to keep an interest, and it will be hard to leave it alone,” he says. For more information, see page 10 of our latest publication, Property Express.